Scarlet Tanagers, Rose-breasted Grosbeaks, Western Kingbirds and Bullock's Orioles arrive! I have returned from Israel, and it looks like I missed quite a lot of migration here. While I was unable to keep up with weather conditions in the US, from what I understand, the weather was good for much of the week which has been great for migration. There have been new arrivals all along the Gulf coast, including the first reports of Summer Tanager, Scarlet Tanager, Orchard Oriole, Eastern Kingbird, Rose-breasted Grosbeak, Indigo Bunting, and Blue-winged Warbler. Here in Chattanooga, I returned to the sights and sounds of Blue-gray Gnatcatchers (lots! ), Worm-eating Warblers, and White-eyed Vireos. I can also tell there was good flying weather by how far north migrants have flown. Many birders have observed some of the early arriving migrants, like Yellow-throated Warbler, Louisiana Waterthrush, Northern Parula, and Blue-gray Gnatcatcher, as far north as Pennsylvania, New York, Ohio, and Illinois. There has been a lot of migration taking place out west as well. 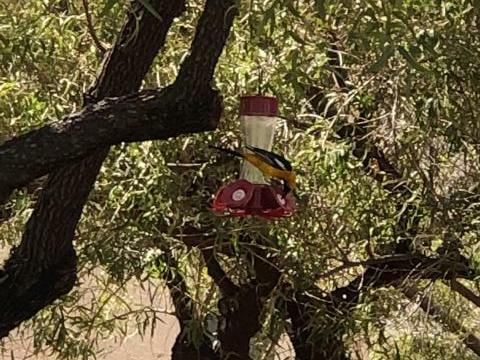 Birders in California and Arizona recorded the arrival of the first Western Kingbirds, Ash-throated Flycatchers, Black-headed Grosbeaks, Wilson’s Warblers, and Lucy’s Warblers. Just as migrants in the eastern and central US were able to make good progress northward, the same was true for the western migratory species, such as the Bullock’s Oriole and Western Kingbirds both observed in Utah. Warblers were seen in Washington. The first Tree Swallows arrived in Montana. Unfortunately, the coming week does not look as good for migrants. In fact, many places are going to see a return to winter! If you look at the weather map, a cold front has moved into the eastern US bringing rain and light north winds. This weather has slowed migration a bit, but winds are going to shift to the south today along with clear skies, so there should be good migration today and tomorrow over much of the eastern US. The big weather story is farther west, where you see a very strong cold front moving through the Rockies, which will arrive in the Midwest and Gulf coast today. The front will bring blizzard conditions to the Great Lakes region and strong storms to the southern US. This storm will essentially shut down migration west of the Mississippi River for several days. As the front moves east, we will see a similar situation for the eastern US over the weekend, with snow in New England and storms in the Southeast. Snow and cold temperatures will prevent birds from migrating to these northeastern coastal states next week. By the time this cold front reaches the eastern US, conditions in the western US will have improved allowing bird migration to resume by the weekend. We are approaching the peak of spring migrations, so it should be active for the next few weeks!